Author. Lecturer. Family History Researcher. In a previous post, I described my experience visiting the Whitney Plantation in Wallace, Louisiana. The plantation was the home of a prominent German family named Haydel who owned many slaves. 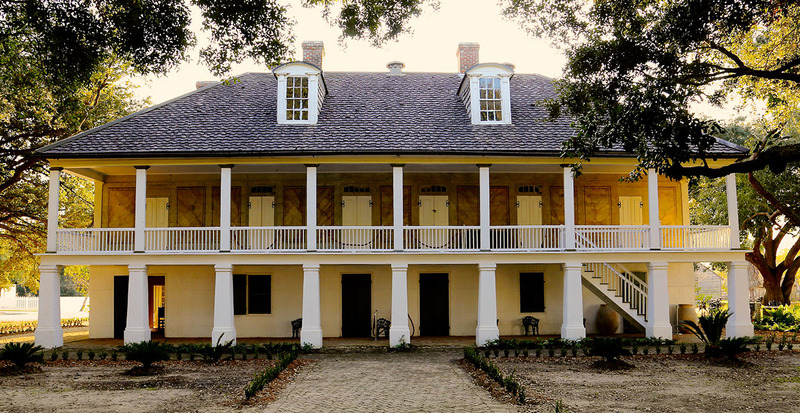 The property has been restored and serves as a museum dedicated to those enslaved inhabitants who built, lived and died there. I found myself interested in both the property and in the Haydel family because, through my research, I discovered an ancestral connection to them. During my tour of the Whitney Plantation, we visited the big house. 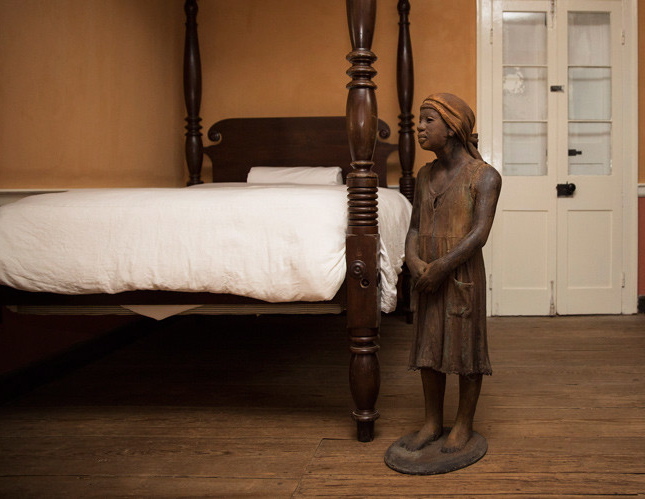 In one of the bedrooms is a four-post bed and a cast iron statue standing next to it. The statue depicts the image of a young girl, who the tour guide explained was an enslaved child named “Anna”. Having seen Anna’s name on the Wall of Honor earlier, and now seeing the lifelike image standing in the room, I felt that her presence had somehow come to life. Suddenly, I had a desire to understand as much as possible about her. The story goes on to explain what many descendants in the family believed Anna’s ancestry and racial make up was. Oral history passed down from elders can be valuable; however, these memories should be researched carefully to separate fact from fiction. As a researcher, you should locate any documents to support these oral histories, if possible. In the case of Anna, this is exactly what I set out to do. As an enslaved girl, Anna bore a child named Victor. Victor Haydel’s lineage has been proven through ecclesiastic records and other documents housed at the St. John the Baptist catholic church in St. John the Baptist Parish and various archival depositories in Louisiana. 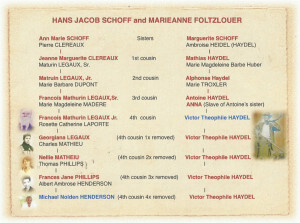 Through birth, marriage, and death records, I have connected my own lineage to the Haydel family through two sisters — Ann Marie Schoff and Marguerite Schoff. 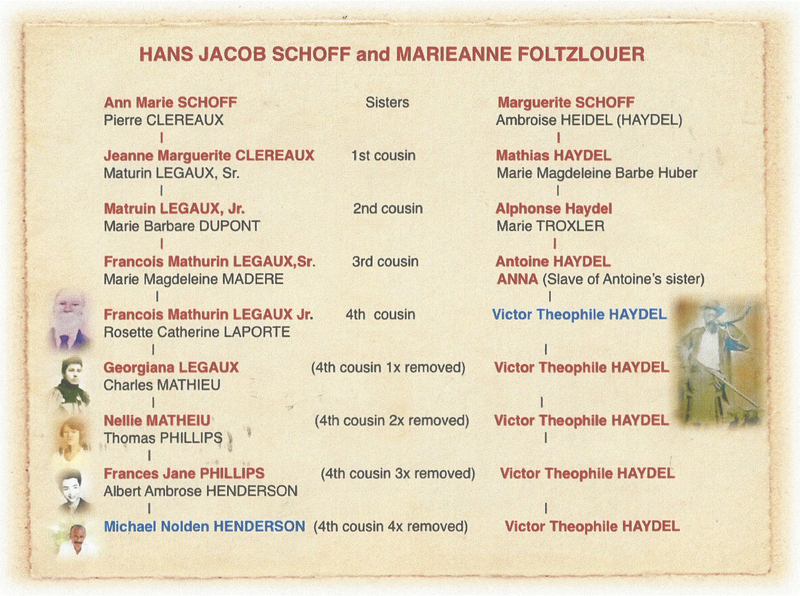 This pedigree chart traces my ancestry to the Haydel family through my maternal line (Henderson, Phillips, Mathieu, Legaux, Clereaux, Schoff (Chauf)) leading to the two Schoff sisters. Double click charts below for closer viewing. Below is a baptism record of Victor Haydel, listing his father as Antoine Haydel and his mother as Anna. 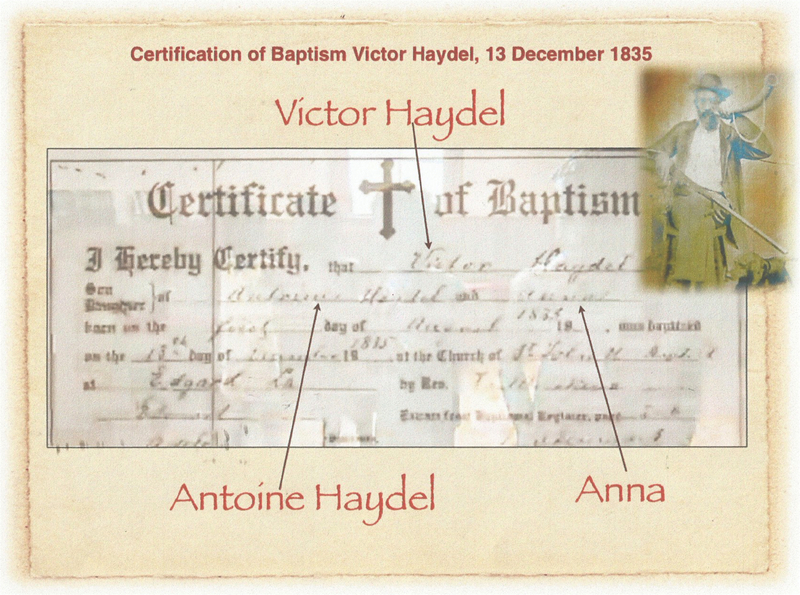 Certificate of Baptism for Victor HAYDEL, the Mixed race offspring of Antoine HAYDEL and the Enslaved female ANNA. 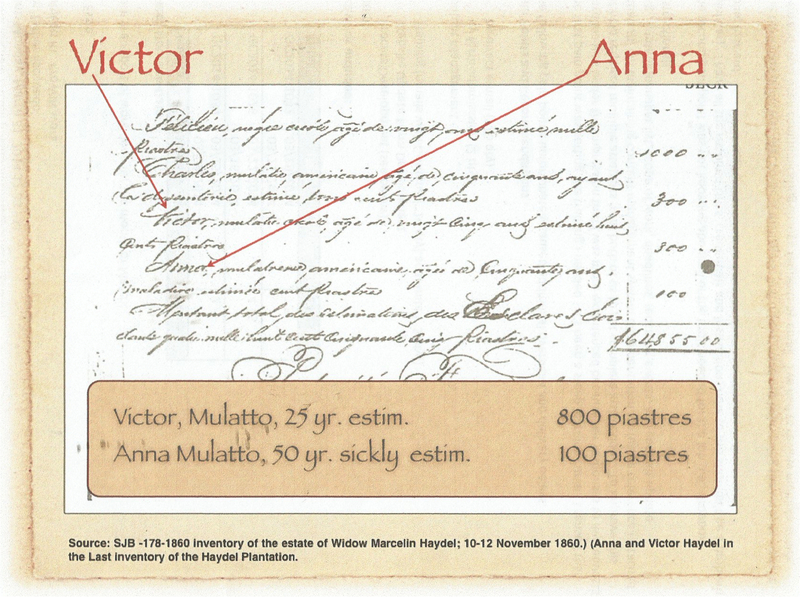 There is also a record showing both Anna and Victor as part of an inventory of slaves being assessed after the death of Marie Azélie Haydel. Source: SJB -178-1860 Inventory of the estate of Widow Marcelin Haydel (Marie Azélie Haydel); 10-12 November 1860. Anna and Victor Haydel in the last inventory of the Haydel Plantation. So what is the significance of these two documents? 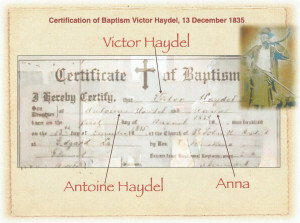 The name of Antoine Haydel (who is a white member of the Haydel family) is listed as the father of the mixed-race child, Victor Haydel on the certificate of baptism. Records in other states rarely show documented evidence of white slave owners as parents of black slaves. However, in Louisiana there are many instances where these relationships are documented. The baptism record can serve as the beginning paper trail in gathering evidence of a bloodline connection to the white Haydel family on the German coast of Louisiana. This mixed-race person born of a mother who was enslaved makes the child enslaved, according to the Code Noir in Louisiana. This law states that the status of the child will follow that of the mother at the time of birth. These laws were enacted in Louisiana as early as 1724 during the French colonial period in Louisiana. They were later modified, yet still defined the status (free or enslaved) of individuals born during the time of Victor’s birth. The child identified as Victor is given the surname Haydel, which is the same as the white family that owned him and his mother, Anna. Consequently, it is the same surname as the man identified on Victor’s baptism certificate as his father, Antoine Haydel. 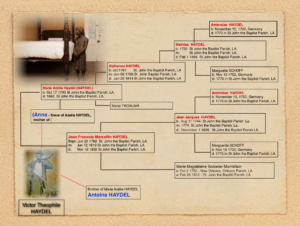 Since the father, Antoine Haydel is the brother of the slave owner, Marie Azélie’s Haydel, that makes Victor Haydel not only Azélie’s slave, but her blood nephew. 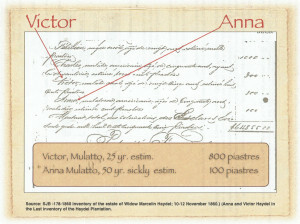 The slave inventory of the estate of Widow Marcelin Haydel (Marie Azélie Haydel) indicates that both Anna and Victor Haydel remained as her property and lived on the Haydel Plantation until her death. 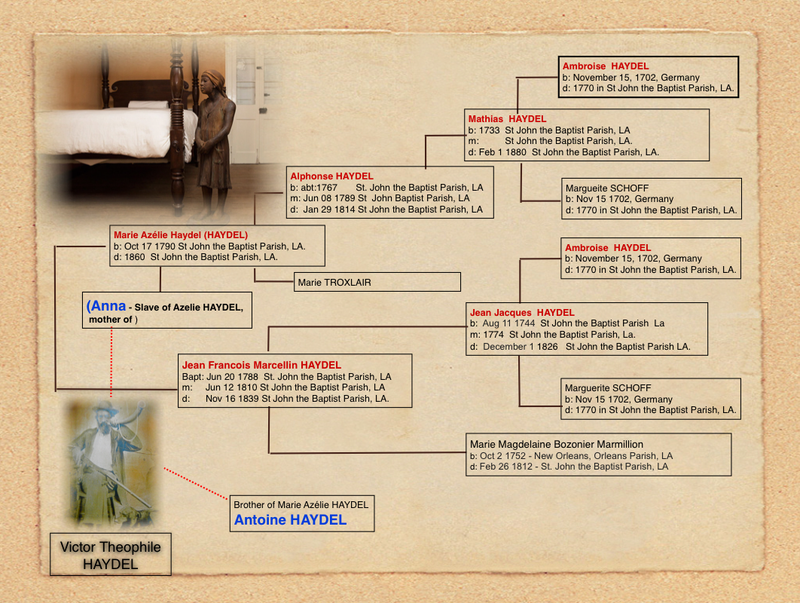 See below chart of the Victor Haydel family lineage. Stay tuned for a follow-up story in my next blog post describing Victor’s life as an adult after 1860. I’ll explore the first generation of Victor’s offspring born after slavery was ended in Louisiana, and more of what I learned while visiting the Whitney and surrounding community. Hello Catherine M. Haydel. Thanks for contacting me and letting me know about your descent from Victor Haydel. I would like to communicate more with is their an email address. 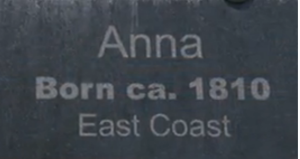 According to Anna date of birth 1810 and Victor date of birth 1835; Anna was not in her teens when she had him she was 25yrs old. Took the opportunity to visit plantation. Victor is my great great grandfather. His son Victorin is father of my frandfather Adam R Haydel Sr. I am the great great grandson of Victor Haydel. His son Victorin is my great grandfather and the father of Adam R Haydel Sr my grandfather father of Adam R Haydel Jr. I took the opportunity to visit the plantation to educate myself as well as my son. I would like to know more about Anna if possible. A Proud Military Legacy Documented Back to 1665.